This is another example of an initiative coming from the climate change frontier rather than the government centre. It was an entertaining account presented with a cast of characters and leading to a “happy ending”. However there was less conflict between the different levels of narrative than I expected – the story was not presented “warts and all”. Interesting reflections. Showed the value of alignment with the political context, the importance of engaging with ministers, senior politicians to create a momentum around a pledge….but what was the impact? Utterly pointless subjective history which can be of little value to anyone reading it. An interesting read – well structured – it offered ideas I could use – it told a tale of innovation – there was a story and characters with a bit of drama. You can read a precis of readers' comments here. 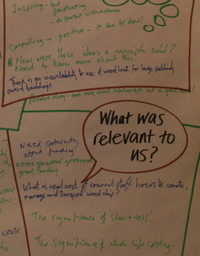 The Nottingham Learning History can be downloaded from the Lowcarbonworks project website here. 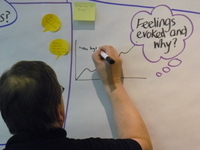 At the workshop active readers recorded thoughts, feelings, and ideas in workbooks just after they had read the Nottingham Learning History (which can be downloaded from our project website here). You can read the headline responses here. But here's a summary of the reader's comments. It’s an idea whose psychological time had come – but has now the psychological time for action come? 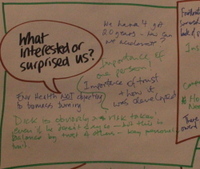 This comment captured the mood of most readers who engaged particularly with questions around the effectiveness of the Nottingham Declaration. This, must be measured by the strategies adopted by the signatories wrote one reader. Another reader had first-hand experience. Their council had signed the Declaration “to join the club” but had then left it to languish until a new head of service came in. This reader asked: “Has there been a demonstrable shift in awareness, carbon reduction, consumption patterns in each of the signatory Local Authorities?” The history provided scant answers to such questions and this absence was missed by readers who noted that influencing policy is but one half of the story. 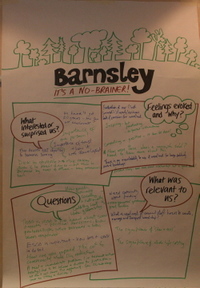 Whilst there was recognition for “the old adage, that national processes and partners can help position an issue and win commitment within an organisation” readers were interested in the relationship between a statement of intent and the associated actions that result. There is a possibility to move the Declaration to the next level noted one reader which could involve quite specific actions that link to the other Histories: e.g. adopting a Merton Rule, installing DHP, forming an ESCO. There was a general appreciation for the ‘resilience, focus and tenacity’ of the officers in the case and in particular a recognition and empathy for the protagonists during the lean years. “ What was the protagonists’ mindset during those lean years?” wondered one reader. Mike’s role may have been underplayed commented one reader who wrote that an “enthusiastic and brilliant policy officer of this kind should be celebrated”. One reader found the history of no relevance. "Why should I be interested in who said what to whom and when?" he asked. This is academia getting bogged down in an issue of no lasting, practical relevance. he went on to say. Find out what other readers of the Nottingham history did find relevant to their experiences and challenges here. 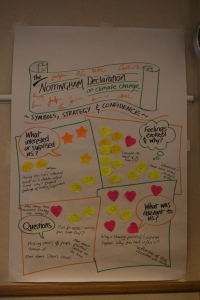 The Nottingham Declaration history (which can be downloaded from our project website here) reminded some active readers of similar initiatives they knew of that had gone less well. One reader recalled how some green initiatives that had been introduced by their council leader had met with considerable resistance. Another reader recalled a similar initiative in their Local Authority that had failed. The History has “given me insight to look at what happened there and to think what we might need to do to re-invigorate this and make the most of the opportunities that come along”, wrote that reader. These kind of reflections led readers to consider the success factors in Nottingham more closely and for one reader to suspect the history as not being a “warts and all” account. “There was only one case shown of a set-back and that was just a faltering”. One reader commented that the association with of Nottingham in the name was a double edged sword – “it provided a sense of Local Authority Leadership but that engenders a degree of enmity too”. We need co-operation rather than competition in our Borough wrote another reader. More generally the history reminded another reader of the role he has played in managing the dynamics between politicians, officers and the community to create a common purpose and processes. The reader went on to wonder how he might use natural networks to motivate and support champions in his own organisation.